This insect was introduced from Europe and has since spread over much of North America. Its range in British Columbia includes the south coast and the southern interior valleys. 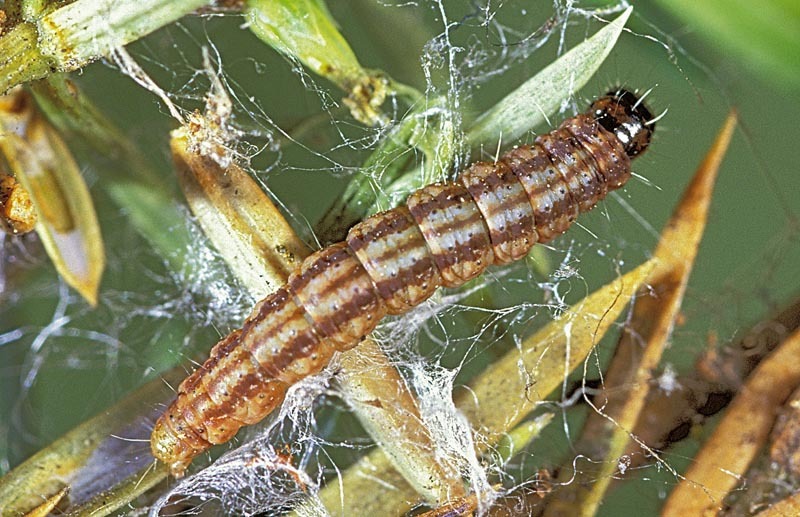 The juniper webworm can cause severe defoliation. Heavily infested trees may turn completely brown. On less heavily infested trees, communal nests made up of dead needles, twigs and webbing contrast sharply with the surrounding green foliage. Early signs of infestation often go unnoticed because larvae tend to inhabit the dense, inner parts of the tree. Egg: Subcylindrical with rounded ends, 0.5 by 0.3 mm, white when laid, changing through yellow and orange to red just before hatching. Larva: 0.5 to 1.0 mm long and yellowish to buff when newly hatched. A mature larva is about 12 mm long, light yellowish red with three dark reddish brown dorsal lines. The head, thoracic shield and legs are black. Pupa: 6 mm long, dark brown; usually enclosed by a soft, white silken cocoon. Adult: A wingspan of approximately 16 mm. The forewings are copper brown with conspicuous white margins; the hind wings are grey and heavily fringed. The head and upper side of the thorax are covered with stiff, white scales. Adults emerge during May and June. After mating, the female lays an average of 45 eggs, usually singly in leaf axils on new growth or in bark crevices. Eggs hatch in 10 to 14 days. A young larva initially mines needles causing them to turn brown and die. As the larva grows, it constructs a silken tube to nearby needles where it feeds externally. As the feeding area increases, adjacent feeding sites overlap and by fall it is common to find three to five larvae in a single large webbed area. Larvae overwinter at various stages of maturity ranging from fifth to eighth instar. Following this period of relative inactivity, the larvae then feed extensively in April and early May before pupating. The pupal period lasts about 2 weeks. 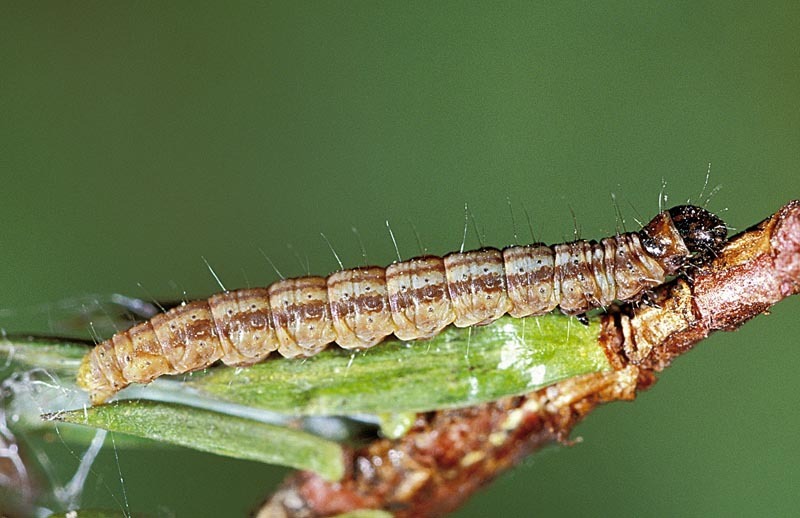 The juniper webworm feeds on junipers having needle-like leaves, including common juniper, Chinese juniper, eastern redcedar, and creeping juniper.